Low fat diet plans can be valuable not only by enabling you to lose weight, but also by improving your overall health in general. Saturated fats have been linked to a number of health problems such as coronary heart disease, stroke, and cancer and, as many diets that are high in fat will cause obesity, they can also lead to Type 2 Diabetes. Fortunately there are a number of healthy diets to lose weight available that can help you to shed excess pounds and lower the level of cholesterol in your blood. 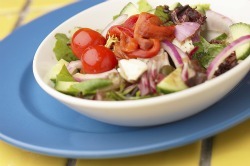 Low fat diet plans can be among the healthiest programs available and are often suitable for long term, sustained use. Along with allowing fats to be only about 20%-30% of your daily caloric intake, these plans also encourage you to eat plenty of vegetables and fruit along with whole grain breads, rather than refined or processed foods. These low fat high fiber diets can help you to lose weight and strengthen your heart but, as with any diet, it is also a good idea to include exercise in any of these plans to assist not only with weight loss but also to tone and firm muscles as well as burning off more calories. On the plus side, most of these diets are designed to be programs that you will be able to use not only to shed some excess pounds quickly, but to maintain what you lose. Animal proteins are just as necessary to our overall health as are vegetables and whole grains, and any good low fat program will include servings of these foods, too. Choosing leaner cuts of meat and removing as much fat as possible before cooking will help to keep the level of fat down, as will broiling or baking the meat. Chicken and fish are naturally lower in fat than beef, pork, or lamb and will provide high quality protein. Remember though, that healthy diets to lose weight will not exclude fats entirely, as fats and fatty acids are necessary for health, too. There are a number of responsible and nutritionally sound low fat diet plans available that can help you to lose weight, and many of them offer online support. The Weight Watchers Diet Plan is one that has helped thousands of people over the years to lose weight and keep it off... Slimming World will not only offer you a way to get into shape, but this plan does not require you to count calories...And because it does not call for extreme food choices, thePritikin Diet can also provide a sustainable weight loss. If you need to lose weight and want to keep it off, check out one of the comprehensive low fat diet plan reviews below for more information.